I feel like this map would make Philly UBER accessible by transit. Was the plan always to go to all four squares? If we had that today it would be amazing. It plays off of Penn's original plans for the city very well. I also feel as if though the Passyunk Branch and the Market Frankford branch going down the waterfront would make copious amounts of money. I apologize if this is a copy of an old thread, but I'd be interested in hearing your thoughts on this. We all can agree that Philly needs more transit, and if this Amazon deal comes through over here, we might actually either have to or be inclined to get some. This is amazing, albeit wishful thinking. It's a shame how politics and lack of funding effectively blocked a system such as this. If SEPTA's map looked like this today, perhaps their reputation far as On-Time Performance goes would be better. It seems that subway trains are faster and more efficient at keeping time than buses. I'm speaking anecdotally on that, I don't have the data to prove it. If someone could create this system on a train simulator game that would be awesome. Also is there a larger/higher quality version of this? A few of the lines are cut off in the image. Imagine the rolling stock, station layouts, ah. One can dream. Some versions of this plan had the Camden line running South under 5th St. to Locust St., and the 8th St. line running West under Walnut St., and then Sansom St. and possibly 42nd St. to become the Darby line. Digging at 8th & Locust Sts. in 1917 was for straight through on Locust St., it wasn't altered for the curve into 8th St. until 1930. Here is the best version I have come across. Thanks "hgondilon" for the HQ version. I notice that the Broad Street Subway 1 Line (which mirrors the current mainline) would terminate at Cheltenham. However the line continues straight with a new stop at Spencer, and no stop at Fern Rock. I wonder how the track layout would work. At Olney the mainline curves east to access Fern Rock, and the ramps which are only accessible from the center express tracks seemingly go north. Would the ramps be used to access Cheltenham? 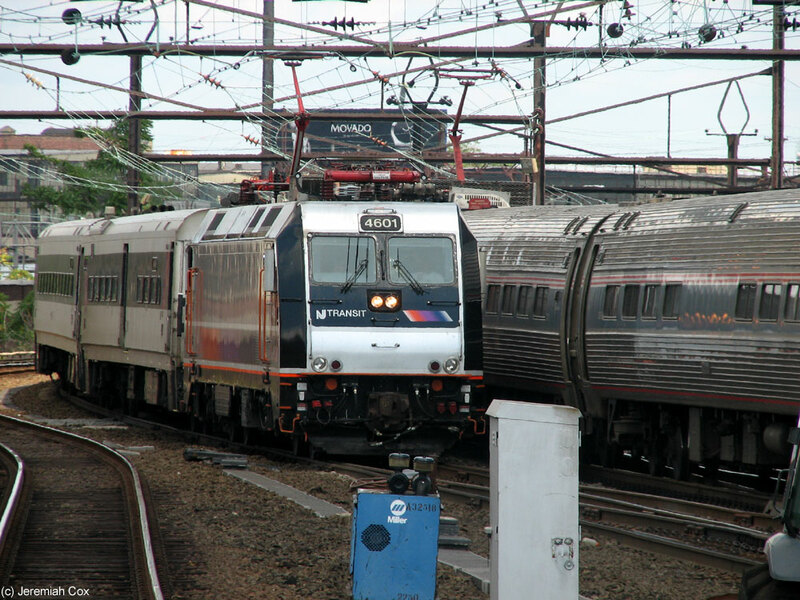 I guess there would be a much larger interlocking at Olney for the mainline to both continue to Fern Rock and on its revenue run north of Olney on Broad Street. It seems hard to imagine that to access Cheltenham, that all trains would have to squeeze into the express tracks. Unless some trains would terminate at Olney and loop at Fern Rock. I know Fern Rock existed for a while as a non-revenue location, as it was for storage and maintenance for years prior to the BSS station being built. So I guess my question is, does this map consider SEPTA's current layout? Or is it based solely on original plans (as evidenced by the downtown loop, Columbia station, which is now Cecil B Moore, and Spring Garden on the Spur)? Northbound local track has a ramp at the North end of Olney station. I don't know if it has been built far enough to connect with the express ramp. Westbound local track under Grange St. has a right hand connection to North on Broad St., and as the present track turns South on Broad St., it has a trailing points connection from North Broad St. Of course, none of these 3 connections ever had track. So it seems there was a plan for there to be some sort of wye between Olney & Fern Rock near the ramps. Interesting. - Would this system have any express service on the BSS 1 Line? As there would be 2 additional lines (3 & 5) running express on the mainline. Even the 3 (Some of it is part of the current Ridge Spur) doesn't stop at North Philadelphia, nor continue to Olney as it seems to follow its original route by diverging at Erie. I'm thinking how South Broad would look. Currently there are 2 tracks, but seeing how there would be 2 services (1 & 5) running from Walnut-Locust to Tasker-Morris, it might have 4. The 1 line is local, as where the 5 line is non-stop entirely from Walnut-Locust to 16th & Passyunk station. At Tasker-Morris the 5 line would split, but bypasses the station to some sort of transfer (I'm assuming not free) between Snyder and 16th & Passyunk stations. - Would there be 4 tracks? Or would the 5 be riding yellows behind the 1 in the current 2 track arrangement? - Also how would the junction between Snyder & Takser work? I know the tracks shift westward between the two stations, but it seems unclear. Almost every other junction on the BSS is a flying one. Plus between Snyder & Tasker it's hard to see any indication of a unbuilt flying junction or unfinished tunnel, as is common with the other junctions on the BSS. There's just the tracks shifting westward. I think of Sports-Expresses running on that stretch, but those trains are fairly rare and can be worked around in the current 2 track arrangement. Or would Sports-Express trains even exist in that arrangement? I'm quite sure that 1913 Philadelphia is quite different from Philadelphia today. As the creator of this map, I will try to answer some of the questions posed above. Would this system have any express service on the BSS 1 Line? 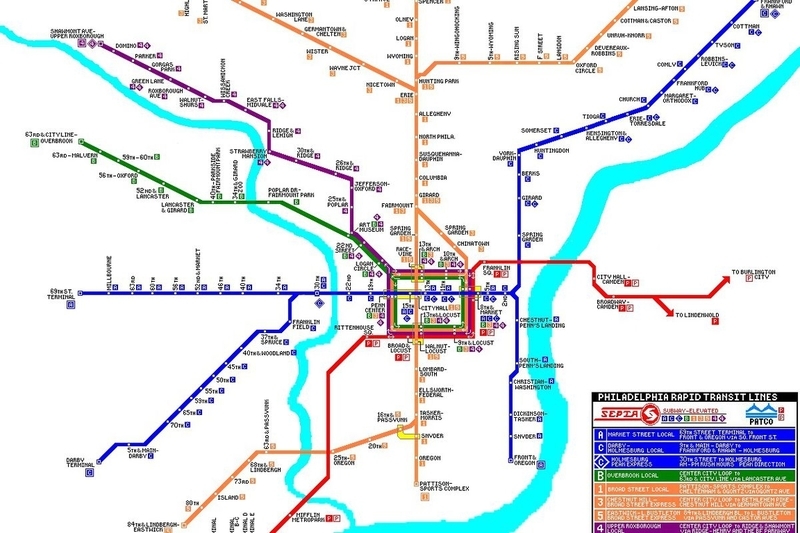 As the map shows, the 1 train is an all times local, although I guess a peak direction express could be operated hitting all stops above Olney, then express to Walnut Locust or going around the loop. Taylor envisioned the local though. Would there be 4 tracks? Or would the 5 be riding yellows behind the 1 in the current 2 track arrangement? - Also how would the junction between Snyder & Takser work? Yes, there would be 4 tracks to just south of Tasker-Morris,where the two inner express tracks would go down one level and go west under Passayunk to the 16th&Snyder station. There would be a series of diamonds before the descending tracks to give flexibility. This configuration was not part of Taylor's plan... his notes do not elaborate on it... just says that a branch to Eastwick would diverge here. A free transfer could easily be accomplished with a 2 block concourse between stations. So I guess my question is, does this map consider SEPTA's current layout? Or is it based solely on original plans (as evidenced by the downtown loop, Columbia station, which is now Cecil B Moore, and Spring Garden on the Spur)? When i made this map, I envisioned it how the system might look shortly after the SEPTA takeover... Hence Columbia. Taylor's loop actually used Broad Street as it's Western side... I thought 16th would work better. By 2017... Spring Garden might still be closed even with this system. Other ares where I made changes to Taylor's plan is that the 5 train only uses the Blvd up to Oxford Circle and then uses Castor Ave to reach Bustleton. Taylor's plan was a line all the way up the Blvd. Taylor wanted the Darby Elevated to reach CC by way of a Chestnut Street subway, not using the Market line like on the map. Also, had this system been built, PATCO probably would not be like it is today, or how it is depicted on this map. The reason is, Taylor envisioned a bridge line that either used Broadway in Camden down to Gloucester or A line to the Camden limts via Haddonfield Ave. Either way the bridge would have not been an option for PATCO and a tunnel under the river with a distribution Subway under Walnut would have been what PATCO would be today. She's more a roller coaster, than the train I used to know. Location: 12yrs before I was born, the PRR "Red Arrow Flyer" Crashed behind my house. The Roxborough subway actually got slightly past the planning stage. The Henry Avenue bridge over Wissahickon Creek and Lincoln Drive was built to accommodate the ROW with space between the arches and portals built into the bridge bulkheads. back from the dead to resurrect a dead thread! There is evidence of an aborted tunnel construction at that location leading west. Its hard to see from a train, but there's a triangular cutout in the tunnel that's about fifteen feet deep on its longer leg. It seems constructed stopped right about the distance that it would have become a separate tunnel and not just an oddly shaped wide spot in the existing tunnel. o484 wrote: Just found this article. ... which includes the telling statement "Endless studies of the lines, their expected profitability, and the incessant rearranging of routes slowed transit expansion to a crawl." Bumping because this is relevant again. However, you’ll notice that the El seems to continue to the Neshaminy Mall along Roosevelt. Is this a possible future extension? mcgrath618 wrote: Bumping because this is relevant again. That's the Boulevard Direct bus SEPTA introduced a while back. The only potential expansion of the El that will ever likley* come to fruition will be the Bustleton extension, connecting with proposed Boulevard Subway. Ah. My mistake. I’m not as familiar with the busses up there as I am with the subways.